Experience for yourself all the activities of a world class resort built around the best old-west ski town. Come visit Breckenridge, still lined with quaint Victorian homes and buildings, where yesterday’s gold boom is now replaced by wonderful restaurants, lots of shopping, all sorts of nightlife, and ski trails that run into the heart of town. So come play in Colorado’s renowned powder snow or get away to some beautiful alpine summer days. 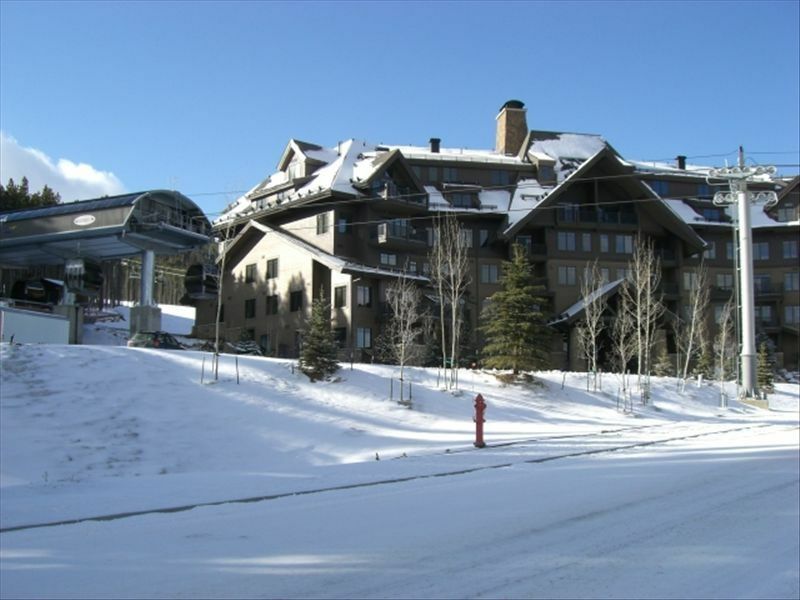 Crystal Peak Lodge, completed in 2008, represents Breck’s finest Ski-In/Ski-Out residences and it's ON the ski slopes at the base of Peak 7. This spectacular forested setting is a gateway to the tranquility of Peak 7, the hubbub of Peak 8, and the perfect mountain town below. More specifically, Crystal Peak Lodge is nestled between the Independence SuperChair lift on one side (about 30 yards) and the BreckConnect gondola on the other side (less than 30 yards). Although above the town, the lodge is self-sufficient with an in-house ski/board rental shop, lift ticket office, day spa, fine dining at Sevens restaurant, and private ski lockers. To access the mountain, simply step out the backdoor to board Peak 7’s Independence SuperChair or jump on the gondola for a very short ride to Peak 8, with its variety of restaurants, the ski schools and the Rocky Mountain and Colorado SuperChair lifts. In the other direction, the gondola whisks you to historic Main Street in Breckenridge. From Crystal Peak Lodge you’re also on cross country ski and snowshoe trails (summer hike and mountain bike trails) that lead through Cucumber Gulch and other more remote areas of White River National Forest. Look out for the resident moose! As you walk into Crystal Peak Lodge, heavy timbers, stone, wrought iron and lots of glass set the tone for this Five Star mountain retreat. Initially you’ll be struck by the grand staircase in the entry leading to a cathedral-like gathering room filled with cozy sofas and tables and overlooking the ski slopes through a wall of glass. Separated from this lounge by a massive fireplace is a game room with billiards and TVs. Next door is the state-of-the-art fitness facility with its stationary bikes, treadmills, a steam room and other fitness equipment all overlooking, through more picture windows, the huge heated outdoor patio with two large hot tubs and a fire pit on the ski slopes! For your convenience, the lodge also provides wireless high-speed internet and a 24 hour front desk. Our particular unit is an elegant residence with a similar rugged, yet refined personality. It features heavy alder doors and trim work; multiple slab granite countertops and stone flooring in the entry, kitchen and baths; rustic cherry cabinetry; distressed wood and bent wrought iron furnishings; and a moss rock fireplace for your cozy evenings. You’ll love the gorgeous views from the balcony overlooking the town of Breckenridge, the Blue River valley and the Continental Divide. Also for your convenience, our condo includes an in-suite washer-dryer set; two huge bathroom suites; and over 1250 square feet of spacious living area with separate thermostats for each room. If you cook, or just like to entertain, you’ll love the fully equipped gourmet kitchen with its open design and the latest stainless steel appliances. The master bedroom boasts a pillow-top king-size bed while the guest bedroom is furnished with a pillow-top queen bed. For your comfort, both bedrooms provide a humidifier, a fan, a goose-down comforter and goose-down pillows (as well as man-made pillows and extra blankets). Both bedrooms are also equipped with a flat screen TV with DVD and satellite. The sofa-sleeper in the living area makes an exceptionally comfy second queen bed. The living area is completed with an entertainment center with a DVD player, satellite and CD stereo, and a large flat screen TV mounted above the moss rock fireplace hearth. Although the location of this condo makes it easy to just leave your vehicle parked for days (if you even bring one), the free and private underground parking also makes it easy to use your vehicle. For added convenience, if you choose not to drive or take the gondola, a free and private shuttle picks up at the front door to take you around town. For further excursions, the Summit Stage, a free county wide bus system, has a hub adjacent to the lower gondola terminal near Main Street. As our guests of Crystal Peak Lodge, the facilities of our sister lodges are also free for your use. At One Ski Hill Place, just 500 yards by gondola or walking, enjoy the indoor pool complex with a dry sauna, the theater rooms or the mine shaft bowling alley; or for a more outdoor experience, Mountain Thunder Lodge, at the bottom of the gondola, offers a year ‘round heated OUTDOOR swimming pool with adjacent hottubs and a heated pool house for an easy change of clothes. Imagine the fun of a snowball fight in a warm swimming pool, or just letting the snowflakes land on your nose as you relax in a hottub! We love pets, but please, NOT in this condo. The entire complex is non-smoking. To book the condo, please see our calendar and rates below, then email or simply call us. Although not necessary, a menu of housekeeping services is available upon request. For another wonderful property that is a little less expensive, please see our Mountain Thunder Lodge condo listing at VRBO #80369. This site also contains many comments from our many previous guests (from North America, Europe and Australia). Cancellations will be partially refunded. Please refer to the attached rental agreement for the actual cancellation policy. We are a family of 4 living in a suburb of Denver. We both work full time while our daughters are full time students. We love outdoor activities and so fell in love with Breckenridge years ago. Now we are fortunate to own this gorgeous second home there. We hope you enjoy it as much as we do! This condo is special not only for its beauty and many amenities, but especially its location. It's tranquil setting on the slopes is wonderful in both winter and summer. Plus, there are SO many things to do around Breckenridge, and many just out the door of the condo! Hiking, biking, cross-country skiing, snowshoeing, trout fishing... the list goes on and on. We love relaxing in the coed steam room or the huge outdoor spas after a day of skiing/riding, then enjoying a nice meal at the on-site restuarant, Sevens. Guests at our condo may also enjoy free use of all the facilities of our sister lodges. At One Ski Hill Place, just 500 yards by gondola or walking, enjoy the indoor pool complex with a dry sauna, the theater rooms or the mine shaft bowling alley; or for a more outdoor experience, Mountain Thunder Lodge, at the bottom of the gondola, offers a year ‘round heated OUTDOOR swimming pool with adjacent hottubs and a heated pool house for an easy change of clothes. Imagine the fun of a snowball fight in a warm swimming pool, or just letting the snowflakes land on your nose as you relax in a hottub! toilet, tub, shower, Large double vanity, separate shower, tub, and toilet room. toilet, shower, Large double vanity. All linens provided with plenty of spare towels, etc. Washer & Dryer provided in the unit. Heated garage under the building. The top end appliances include convection/standard oven, quisinart coffee maker, crockpot, rotating microwave, ice/water dispensing frig, quiet dishwasher, programmable toaster, and more. This beautiful gourmet kitchen comes VERY well stocked with everything you'll need from simple entertaining to preparing a feast for eight. Flat screen TVs, DVD players, and cable in the living room and each bedroom. There is a large stone steamroom in the fitness center. This is a beautiful condo right on the Peak 7 lift. It includes ski lockers, garage and short walk to the peak 7 lift and Sevens restaurant. There is a ski shop in the building. You also have access to the shuttle service that will take you into town-- we never drove our car during the stay. The owners are wonderful and are very accommodating. I would stay there again without hesitation. Our unit was amazing and the wonderful owner was available to answer any questions. The lift is literally out the back door through the convenient locker room. Great onsite rentals. Loved watching the envy on the tired skiers walking by us in the awesome hot tub at the end of the day. Our stay in this condo was wonderful. This is the third time that we have rented this condo and have always been pleased. David is always very pleasant and easy to work with. You can't beat the location and amenities that are on site. We are looking forward to staying here again in the future. If you are looking for true ski-in ski-out this location is second to none. You walk out directly to the Independence SuperChair. This is a pretty big advantage as you can avoid riding the shuttles to the hill in the morning, which allows you to get out far ahead of the massive crowd coming up the mountain. Additionally, you walk out directly to the gondola to quickly get to town without the need to drive. If the gondola is closed there is a complimentary property shuttle that will pick you up anywhere in town to bring you back. Once you park your car in the HEATED garage you will not need to look at it until you have to leave. The building has a ski shop in the first floor. Overall the Condo is clean and very comfortable with a great view over the town below. The owners were informative and very easy to work with. •	Discounts for long stays (greater than 1 week) or last minute bookings (inside 2 weeks) may be available. Email or call for a specific quote. •	Until confirmed, rates may vary without notice. •	During Early Ski Season, Peaks 7 and 6 may not be open, but the gondola provides EASY access to the Peak 8 lifts and trails that will be open.